The staff are always friendly, happy to help, reliable, very efficient and extremely professional. Just to say a big thank you for your services provided in order to get my properties rented out.The level of service has been excellent. When I first contacted Central Housing some of my properties were in a poor state but with your help they were tidied up to a very high standard and rented out quickly with no problems and everything running smoothly, contracts signed with guaranteed rent giving me peace of mind and reassurance that I was dealing with an excellent company. It’s been a pleasure doing business with you all and I look forward to many more years of your excellent service. I will be highly recommending you to others. The high standards have never dropped and I am very happy to know that my property is in the best possible hands…. When I first met Romesh Muthiah over 13 years ago I had had a very bad experience with my previous managing agent and was extremely wary of engaging another one. However my husband and I were easily won over by Romesh when he came to meet us personally at our property to tell us about the services that Central Housing Group (CHG) could offer us. He spent a considerable amount of time with us, answering our questions and allaying our fears. We were so impressed that we signed on immediately, which is no mean feat considering the experience I had had! I am happy to say that we have been with CHG ever since and have not once considered going elsewhere. The service from CHG over the years has consistently been of an extremely high standard. Rents are always paid on time and any deductions for authorised repairs are always clearly documented and copies of supporting paperwork attached. We are notified of Issues promptly and given the option to use our own contractors or CHG’s maintenance team. Where we have used our own contractors, CHG has been extremely helpful in arranging appointments with tenants and making sure things are in order and where we have used their own maintenance team, the prices are competitive and works are carried quickly and to a satisfactory standard. 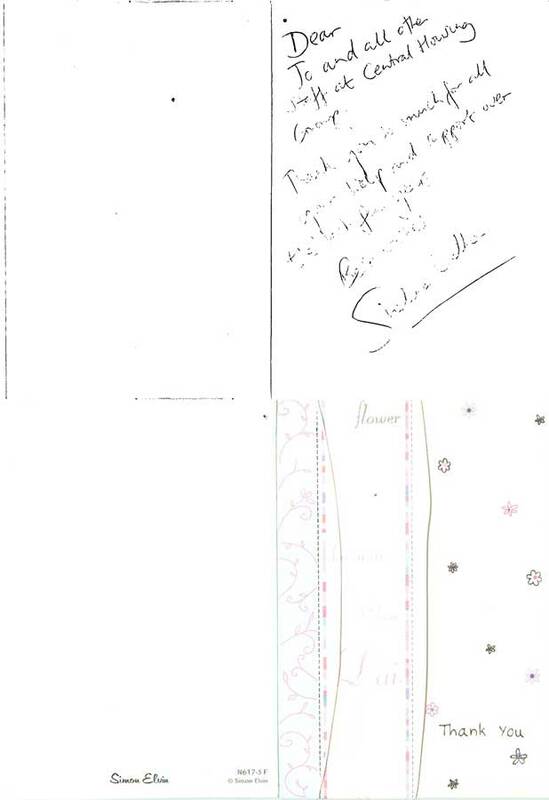 I would particularly like to thank our Property Manager, Helga Sillo who has been our primary contact over the years. 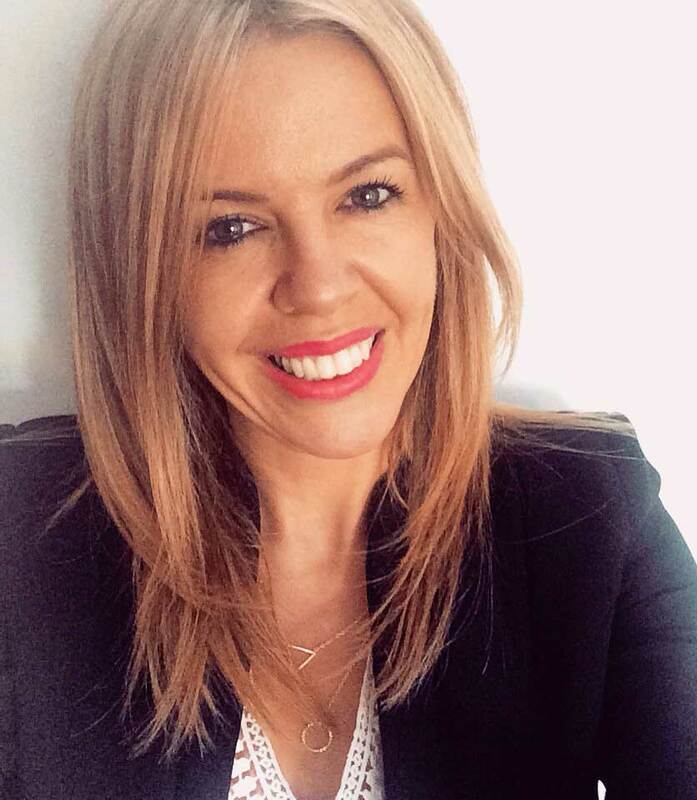 She has always been extremely professional, efficient and attentive – all the things you need, when issues arise or something needs to be done. Many, many thanks to Romesh and the CHG team for the excellent work they do and have done consistently over the years. The high standards have never dropped and I am very happy to know that my property is in the best possible hands. I would readily recommend CHG to anyone looking to rent out their property and I am confident that they would not regret leaving it in the hands of the CHG team. All the staff are extremely pleasant and helpful and there has never been a time when I felt that I did not matter to them…. 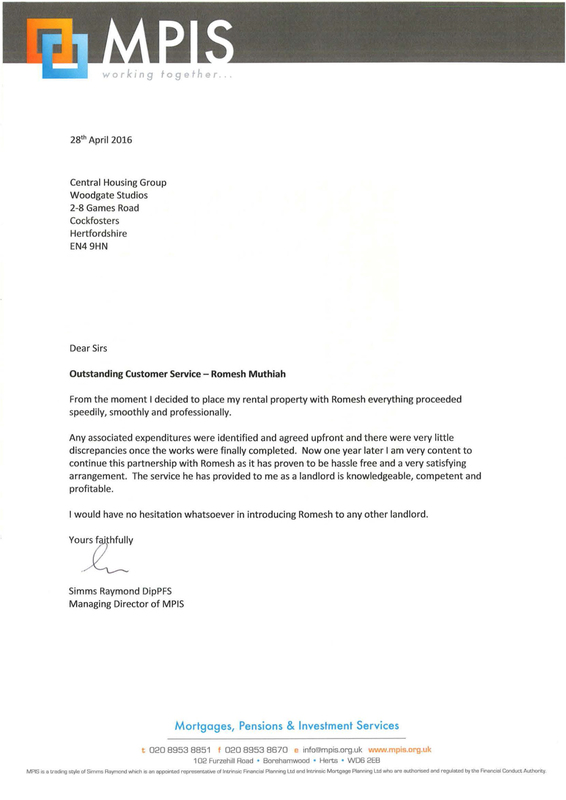 It gives me great pleasure to have the opportunity to write a testimonial for Central Housing Group Limited. Together with a friend, in 2000 I acquired an investment property which was to be my first experience of property letting. We got off to a difficult start with the company which was originally managing the letting, but after much complaining and a bit of luck, we found an alternative company, Central Housing Group Ltd, which took over the handling of our property and things settled down. My friend and I went on to purchase another two investment properties, both of which we handed over to Central Housing for renting out and, later, with my husband, son and daughter- in-law, I purchased a further investment property which, again, we asked Central Housing to handle for us. They are still managing these lettings for us. Romesh, David and their team are a very tight and efficient unit. I always feel comfortable contacting them if I have any queries or concerns, which they invariably deal with promptly and efficiently. They do not allow matters to slip, i.e. repairs or replacements that need to be dealt with, and when site matters have been raised with me (in the case of leasehold properties) by the management companies, they never fail to deal with them promptly on my behalf. All the staff are extremely pleasant and helpful and there has never been a time when I felt that I did not matter to them. When I hear of the letting horror stories of other people, I am very pleased that fate took me to Tottenham/Wood Green (where Central Housing Group was originally situated) all those years ago. I hope that my family and I will continue to be associated with Central Housing Group for many more years to come. However, if it is necessary for whatever reason to “reclaim” any of the properties, I am confident that they will be returned to us in first-class condition. I would like to personally thank you for your personal guidance and professional advice during the recent purchase of a property. I had heard about your Rent Guarantee Scheme and how it helps landlords with their cash flow and peace of mind, but was initially apprehensive. I needn’t have been, especially when working the Central Housing Group who were extremely helpful. I now have a property that is rented out through yourselves with a regular rent being paid on time every month and do not have to worry about chasing tenants or checking on the property. You and your team do this all for us. In addition, should the property ever be empty, I do not lose out on income as this is still paid to us by the Central Housing Group! All in all an excellent service and one I would recommend to any Landlord looking to maximise their return on investment and enjoy a hassle and worry free property rental. Thanks once again. I wanted to thank you personally for the service you have and continue to provide. At the very beginning of the guaranteed letting process you showed professionalism in the way visited the property concerned and explained thoroughly the process of guaranteed rents and how different it was from private rent. That was the easy part, but what I was most impressed with was the way you followed through all the processes and acted in a clear, exact and concise manner. After actioning your observations, my property was rented with little headache on my part and since then you team have continued with your good example by informing me of the property state during their regular visits. The rental income I receive from Central Housing Group is always prompt and takes away any potential stress from me as a landlord. Moreover, the guaranteed rent amount I receive is competitive compared to the amount I would receive from private rent without the risk of private rent. In summary Romesh I would like to congratulate you and your company on a work well done and will certainly recommend your services to any landlord looking for peace of mind in letting their property. If I ever have any queries, they are dealt with effectively and efficiently. I have been a landlord with the Central Housing Group for more than five years and my property has been rented out by them without issue for the whole of that time. The rent is paid to me regularly and if any repairs are required, Jo calls me and we discuss them. I am always asked if I would like to deal with these myself, but who would want to when they can be dealt with directly by CHG without any problem and at reasonable cost. I have no hesitation in recommending CHG to any prospective landlord. I want to express how satisfied I am with you rent guarantee services which ensures that I get regular rent for my property even when it is not occupied. Apart from this obvious benefit, your attention to detail and expertise ensured that the process was hassle free and easy. You even gave me advice on issues which were outside of your scope of work. You patiently explained and re-explained everything to do with the process. Your depth and breadth of property knowledge is impressive and your willingness to help in every situation shows your outstanding customer service. 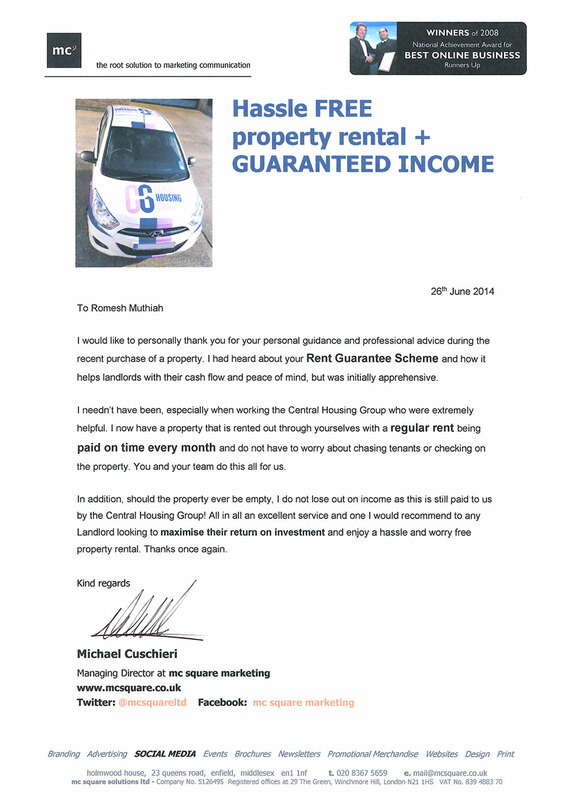 I am really happy I made the choice of renting my property through Central Housing Group. I like to share with everyone how happy I am in my recent business encounter with you. You are a credible professional with a great deal of knowledge in the rental business, particularly guaranteed rental schemes. I am impressed with the way you present your service, having given me also a lot of advice for me to make an informed decision. I think your persona and your approach would put any potential client at ease and unpressured. But what impresses me most is how you insist only in sticking to what you excel at and being comfortable to not take on anything else, as tempting and easy as they may be. The service he has provided to me as a landlord is knowledgeable, competent and profitable. 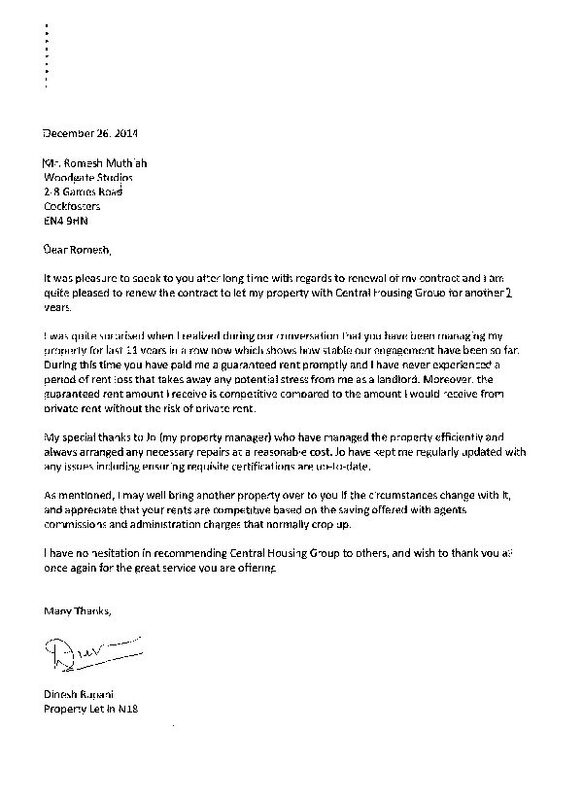 Outstanding Customer Service- Romesh Muthiah. From the moment I decided to place my rental property with Romesh everything proceeded speedily, smoothly and professionally. Any associated expenditures were identified and agreed upfront and there were very little discrepancies once the works were finally completed. Now one year later I am very content to continue this partnership with Romesh as it has proven to be hassle free and a very satisfying arrangement. The service he has provided to me as a landlord is knowledgeable, competent and profitable. I would have no hesitation whatsoever in introducing Romesh to any other landlord. Writing this testimonial gives me an opportunity to try to express my sincere gratitude for exemplary service and efficiency that CHG provide. No matter if you are dealing with Romesh, David or all their staff such as Helga, there is always care and attention in all that they do which other peers in the same field struggle with. In my point of view, the standard that CHG provide is of the highest degree, and from experience, know that others do not have the same desire and passion to deliver. advance of payment which are very clear, and payment is always on time. There are numerous examples that I can give, but the most significant was when I had my initial meeting with Romesh in late Jan’13 and then this was followed with having my property being rented through CHG by mid March’13. 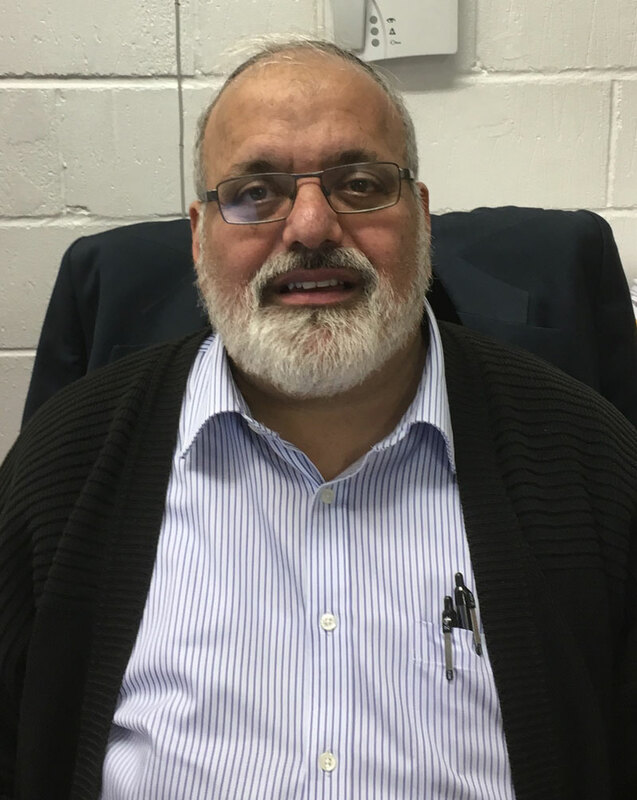 Romesh had met me at the property and took the time necessary answering my numerous questions, and what I needed in order to have the property rented within 6 weeks. He was spot on. He shared a range of local area contacts that helped me deliver ahead of time and this ensured that I did not waste any time in gaining income. experience and I cannot be thankful enough. It really does gives me peace of mind, knowing that I am dealing with a Company that really cares and always delivers. Thank you CHG! I have been a Central client for a few years now. As a novice Landlord they came recommended to me by the vendor of my first investment property and they are certainly well suited to “newbies” like I was. However, now with 3 properties and much more experience of the business under my belt, I have come to value the certainty of their rental payments and professionalism of their management and support. It’s not all about the rent though. With the last of my properties there was some refurbishment work to do and they took care of that with the minimum of fuss and at what I considered to be a very fair price. We even agreed a date when the rental payments would start whether or not the refurb was finished and/or tenant installed. The main point, though, is the guaranteed rent. This is not top market value – you could get a little more letting it yourself – but the point is that it is guaranteed. Same time every month it appears in your bank account. No void periods. No management charges. No VAT. Finally, whilst I have not used this part of the service yet, they guarantee to hand the property back to you in the same condition (allowing for reasonable wear and tear) as they took it, which is a big comfort given that you never really “know” your tenant. In summary, Central Housing Group means “no worries”. No worries about rent. No worries about non-payment. No worries about cashflow. No worries about damage to the property. No worries about evictions. No worries about DSS payments. Just no worries. Highly recommended. In our 9/10 year relationship I have not had to visit the property even once. That says volumes of the service and expertise provided by CHG…. Further to our recent communication I am glad to extend our current contract for a further period of 24 months and would like to thank your team for the service provided with professional efficiency for the past 9 years. 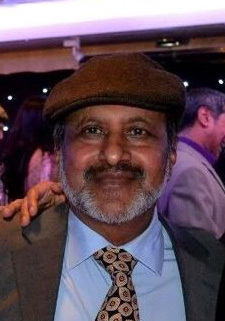 I have been with Central Housing Group since May 2007 and have found your team full of professionalism and friendliness since Romesh first came to view our property for rent. 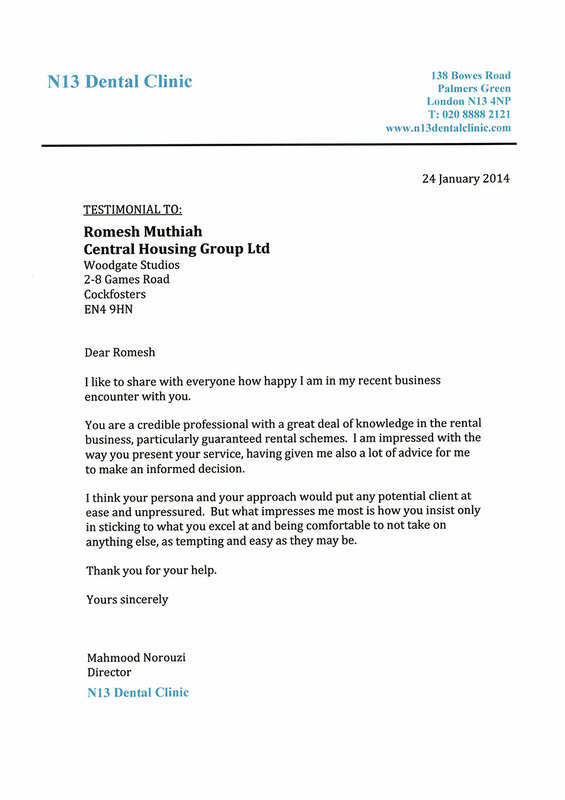 I first met Romesh who came across as very approachable and friendly and trustworthy. He was very honest with me. His advice on what rental we could achieve and what needed to be provided in the property to fulfil legislation and regulations to make it ready for public sector rental. Romesh organised all furniture and kitchen items to be purchased and delivered to the property and the property was let almost immediately. I could not believe how he made the whole business so easy and stress free for me. He arranged for all the inspections, alterations etc and since then the property has been fully managed by Central Housing Group. In our 9/10 year relationship I have not had to visit the property even once. That says volumes of the service and expertise provided by CHG.
We continue to have a very good and honest relationship with Central Housing Group which I find very fruitful and stress free. If any work or inspection is needed on the property we are notified and the said work organised by CHG to be carried out immediately. The rent is paid promptly direct into my bank account on the 5th of every month and I don’t have to worry about the occupancy factor as it is guaranteed by CHG. I am writing to let you know that I am very satisfied with the standard of service provided by Central Housing Group across the leasing platform, from negotiations of rentals to maintenance of the property. I hope to maintain the relationship going forward. 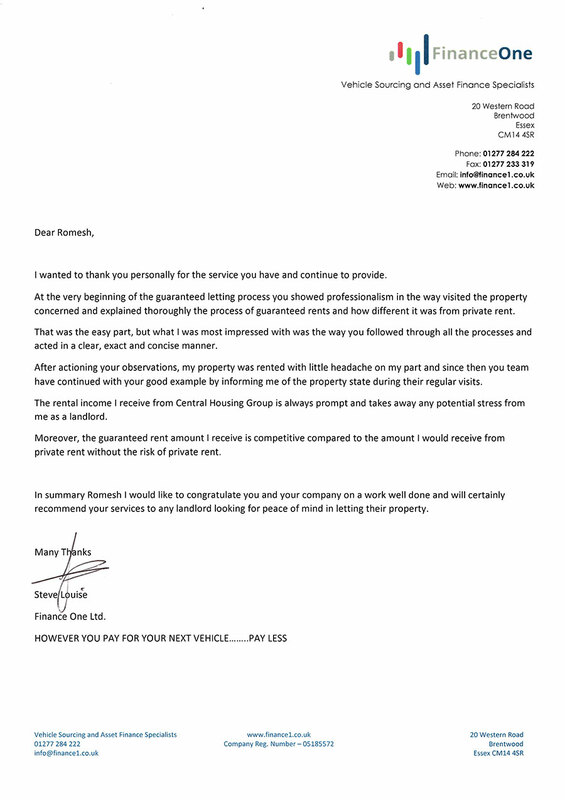 I will certainly recommend Central Housing Group to everyone looking rent out their property and certainly looking forward that you continue to look after my property for many years to come. It was very nice to speak to you recently regarding renewing my contract with you. I wanted to take the opportunity to express how appreciative I am for the thorough and professional letting and management service you have provided me over the last 11 years that I have let my property to Central Housing Group. During this time you have paid me a guaranteed rent and I have never experienced a period of rent loss despite the property sometimes being unoccupied during this period. Your staff have managed the property efficiently and always arranged any necessary repairs at a reasonable cost. Furthermore I was delighted last year to have benefited from your company’s efforts in securing a free ‘A’ rated new gas boiler. This has improved the energy efficiency of my property and no doubt benefited my tenants in helping to reduce their gas bills as well. Arranging the free boiler clearly demonstrated how you and your company go over and above what would normally be expected of a letting and management agent. Once again I thank you and your team for delivering such an excellent service over a consistent period of time. never had to worry about chasing tenants, or any damage caused, or having to make sure that the property is kept in the condition I expect it to be…. 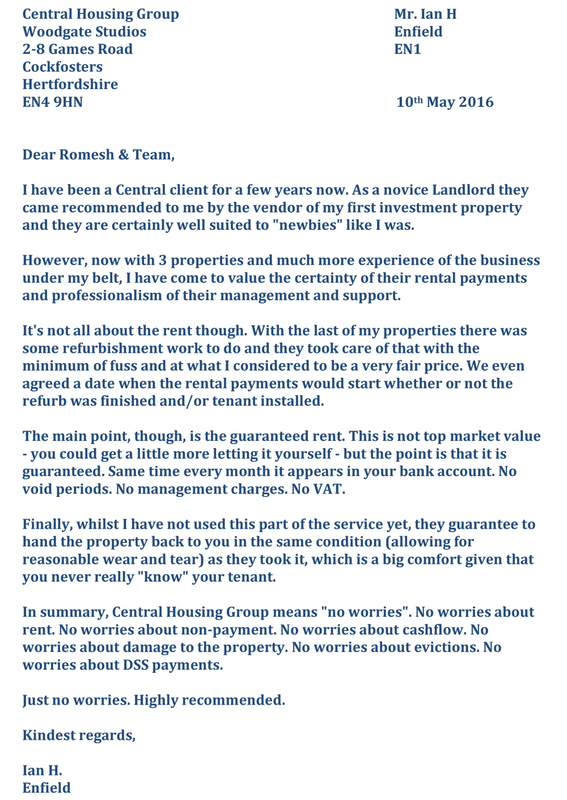 I’m just writing to let you know about the Central Housing Group and their great rental guarantee scheme, run by Romesh and his management team who also provide a fully managed service. I’ve been with the Central Housing Group for just over 12 years and my property has been rented out through CHG with the rent paid regularly, on time and I’ve never had a missed payment. I’ve never had to worry about chasing tenants, or any damage caused, or having to make sure that the property is kept in the condition I expect it to be. All insurances, certificates are up to date and all reminders are given nice and early “what else could a landlord want”. I’m notified of any issues promptly and given the chance to deal with it myself or use their own maintenance team as part of a fully managed service. If I do get a call from Jo (who is always polite and friendly), about any repairs needed, I know that I can trust them to deal with any issues quickly and by their highly competent maintenance team who go about their work in a professional manner and their costs are more than competitive. Romesh, I want to thank you and all at CHG for delivering such a brilliant service and for being so consistent over the years. I know I can confidently recommend you and your team to anyone who may be thinking of renting out their property and from that, I’ve always been happy to renew my contract with CHG.
Keep up the good work and I look forward to many more years of business with you. If I ever need repairs doing they are quick and reasonably priced and I receive my rent on time every single month…..
Testimonial – Fantastic service and prompt rent payment every single month. The Central Housing Group have been managing my property for over 10 years and the service I have received from them has been excellent. It’s hassle free, which is just what you need from a letting agent. If I ever need repairs doing they are quick and reasonably priced and I receive my rent on time every single month. If I ever have any queries they are dealt with quickly and effectively, there is never a need to chase up as I have had to do with other letting agents. I have no hesitation at all in recommending Central Housing Group to other landlords. All the stress is lifted when I deal with Romesh, allowing me to get on with my own business….. I have been dealing with Romesh and his team for the best part of 15 years. 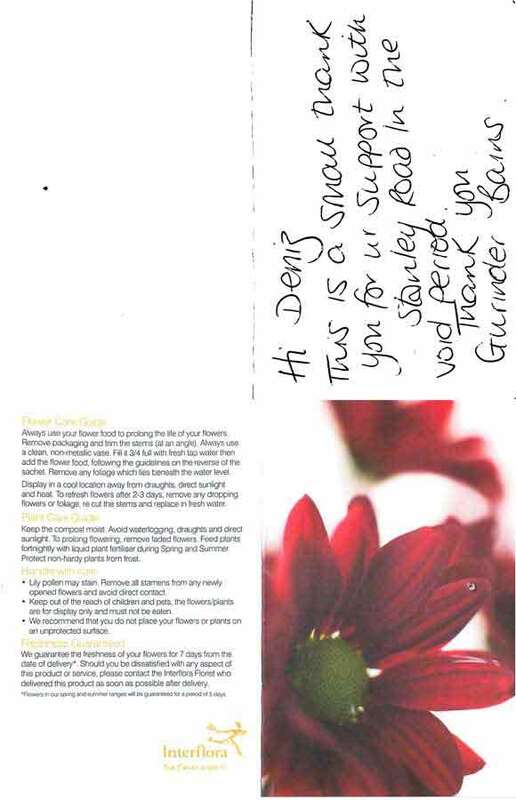 Prior to that I was dealt with by other estate agents who don’t compare to Central Housing. All the stress is lifted when I deal with Romesh, allowing me to get on with my own business, with full confidence that my properties are being looked after, the rent is received with no delay, easy to understand statements and I don’t have to worry about void periods. All in all a class act and a great service. ….we would recommend Central Housing Group to anyone looking for an honest, friendly and Professional Company. 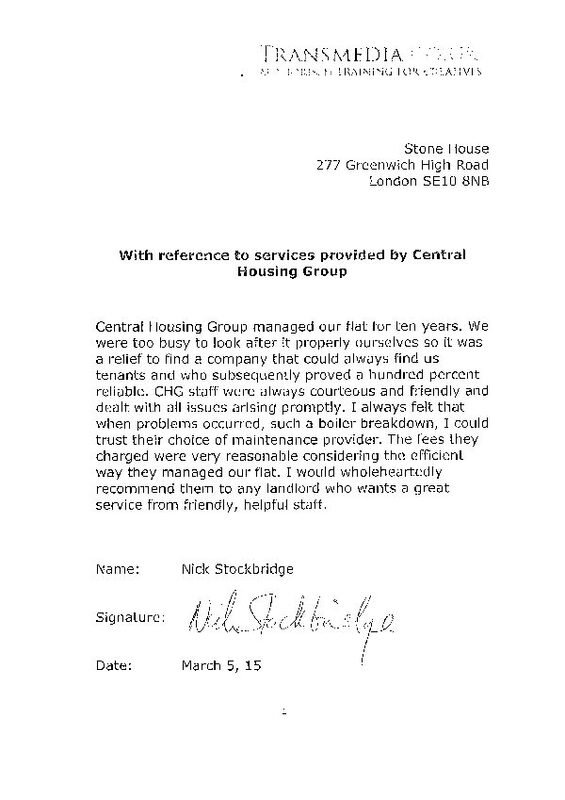 We have been with Central Housing Group since March 2001 and cannot fault them. We chose Central· Housing because of their professionalism and friendliness when they first came to view our property for rental. We first met David Feld who came across as very approachable and friendly, we felt we could trust him and his Company. He was very honest with us. He gave us advice on what rental we could achieve and what was needed to be done to the property ready for rental. David organised all furniture and kitchen items to be purchased and delivered to the property and the property was let almost immediately. We could not believe how the whole business was made very easy and stress free for us. We continue with a very good relationship with Central Housing and completely stress free. If any works need to be carried out, Helga is assigned to our property and she will notify us immediately. We have also built up a good relationship and it is a pleasure to speak with her exchanging pleasantries other than business. On occasions when we have received an invoice for works, I have asked Central Housing if we can pay over 2-3 months instead of all in one go and we have never been refused. Finally, we would like to add that we would recommend Central Housing Group to anyone looking for an honest, friendly and Professional Company. I have always found the team at Central very approachable and knowledgeable with regard to all aspects of managing my properties…. 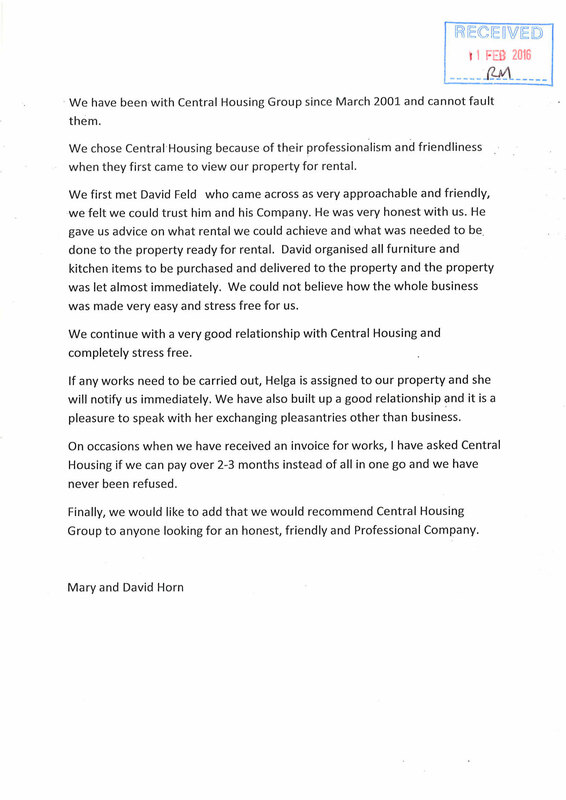 I am very happy to provide a testimonial for Central Housing Group as they have been managing my properties now for over fourteen years. 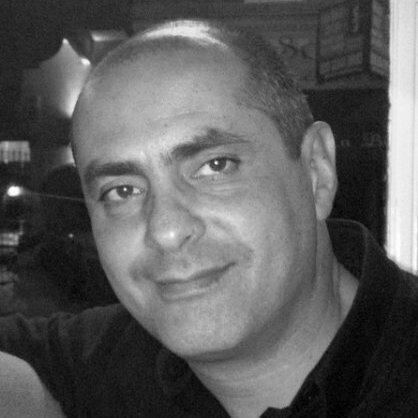 I first met David Feld, one of the Directors of Central Housing Group, in 2002 when his services were recommended to me by a local estate agent. We immediately struck up a good rapport and I can honestly say that I have, since then, enjoyed a good, professional, working relationship with all the team at Central Housing Group. Since that first meeting in 2002, I have passed over other properties into Central Housing Group’s management service and I have also recommended them to my immediate and extended family members who have also let their properties with Central Housing Group and we all continue to be happy with their services. The service we receive is professional and efficient. My rent is paid into my account on time every month and this is accompanied in the post by a detailed rent account statement. At the same time I have always found the team at Central very approachable and knowledgeable with regard to all aspects of managing my properties. 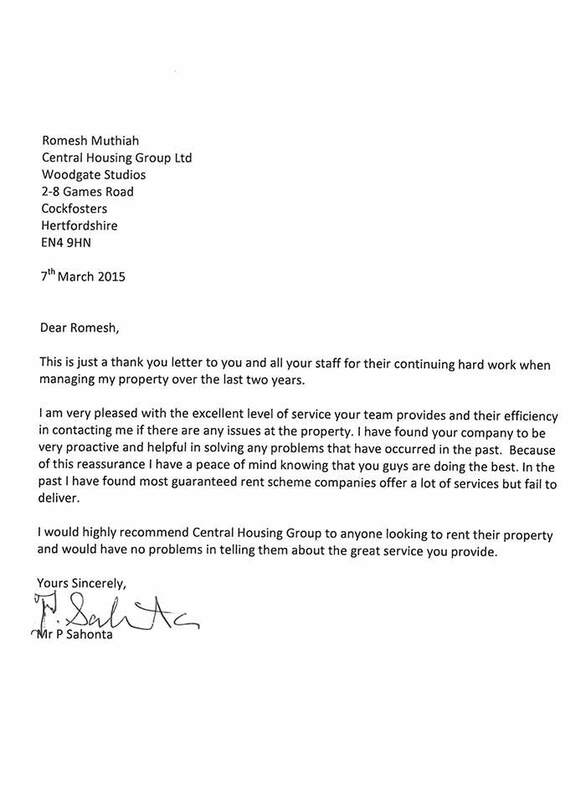 I would be very happy to recommend the services of Central Housing Group to other landlords. 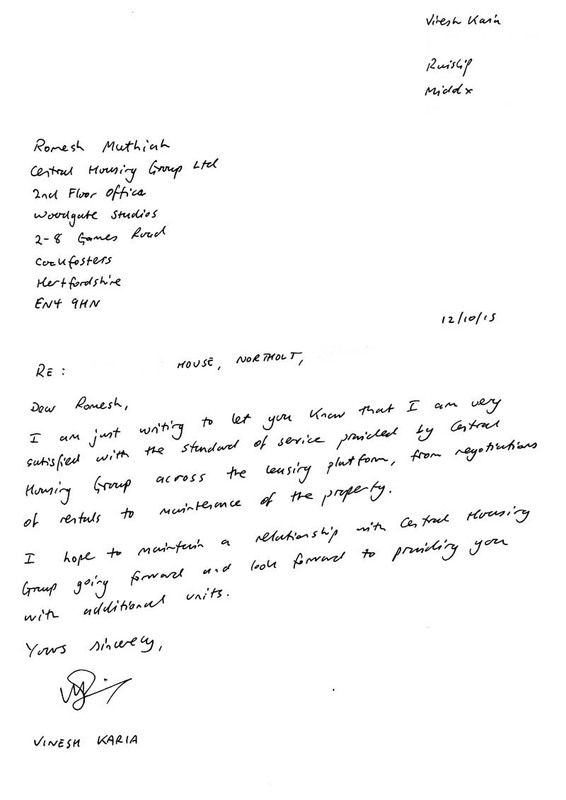 I am just writing to let you know that I am very satisfied with the standard of service provided by Central Housing Group across the leasing platform, from negotiations of rentals to maintenance of the property. I hope to maintain a relationship going forward and look forward to providing you with additional units. I am really pleased to renew my contract to let my property with your company, Central Housing Group. I must say for many years, your company has provided me an excellent service, hassle free letting under Rent Guarantee Scheme and full management of my property which took care of any maintenance issues. I also received reminders when Building Insurance, Gas and Electrical certificates were due. These services are really commendable. Romesh, from day one, you have been very professional, you have guided me throughout the process and helped me to fix whatever had to be done in the property until it was let. Furthermore, you are always contactable; knowing that you are just a phone call away for any advice is an added bonus. In addition, the reassurance I have that Central Housing Group has always been prompt in paying my rent, no worries about rent arrears to cover the mortgage payment. I will certainly recommend Central Housing Group to everyone looking to let their property and certainly looking forward that you continue letting my property for many years to come. Just writing to say thanks for all your help and I am glad to hand over another property to Central Housing Group. I find the company very professional, efficient and knowledgeable and it is great to have peace of mind under your guaranteed letting scheme. Unlike some letting agents Central really does inspect properties regularly and is proactive too. I have no hesitation recommending Central Housing Group and look forward to a beneficial relationship for many years to come. 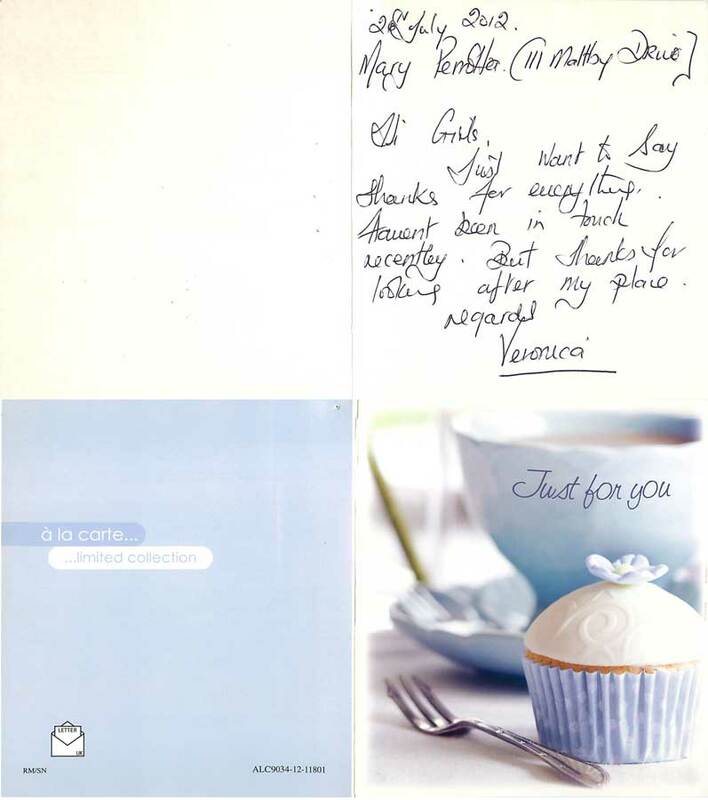 I am delighted to provide this testimonial in evidence of our working partnership over the last 11 years. You are aware that my wife and I own a modest portfolio of properties both here in London and in the United States. I have been very much a ‘hands on’ landlord since I retired from work in 2002. I must confess that working in the private rental sector is very hard work. Checking tenants in and out together with the anxiety of attending to repairs, dilapidations and the inevitable void periods can prove stressful to say the least. In the last nine years, I can say with certainty that I have never had a problem with receipt of rent which can otherwise be a great headache to chase up. 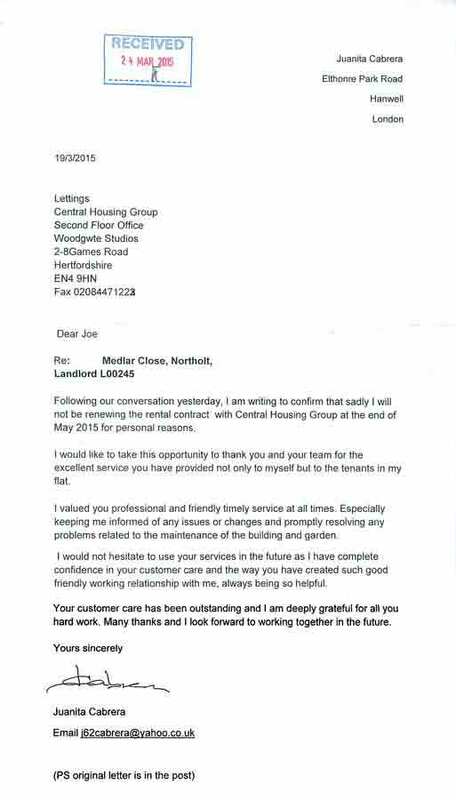 Having recently entered into the tenth year of dealing with Central Housing Group, I wish to express my gratitude to you and the whole team for making my job as a landlord so simple and care-free. Your charges are indeed very reasonable and the fact that you are able to resolve any repairs, certifications etc. without me having to run around is an absolute time-saver. I have noticed the charges applied by your contractors for various works, from tap repairs to decoration and new carpets to fence replacements, and can truly say that all costs are very reasonable with quality work, giving me full reassurance that the property is looked after in a respectable manner. As mentioned, I may well bring another property over to you if the circumstances change with it, and appreciate that your rents are competitive based on the saving offered with agents commissions and administration charges that normally crop up, hence why I have recently renewed for another three year term. I have no hesitation in recommending Central Housing Group to others, and wish to thank you all once again for the great service you are offering. It was pleasure to speak to you after long time with regards to renewal of my contract and I am quite pleased to renew the contract to let my property with Central Housing Group for another 2 years. I may well bring another property over to you if the circumstances change with it, and appreciate that your rents are competitive based on the saving offered with agents commissions and administration charges that normally crop up. I was quite surprised when I realized during our conversation that you have been managing my property for last 11 years in a row now which shows how stable our engagement have been so far. During this time you have paid me a guaranteed rent promptly and I have never experienced a period of rent loss that takes away any potential stress from me as a landlord. Moreover, the guaranteed rent amount I receive is competitive compared to the amount I would receive from private rent without the risk of private rent.My special thanks to Jo (my property manager) who have managed the property efficiently and always arranged and necessary repairs at a reasonable cost. Jo have kept me regularly updated with any issues including ensuring requisite certifications are up-to-date.As mentioned, I may well bring another property over to you if the circumstances change with it, and appreciate that your rents are competitive based on the saving offered with agents commissions and administration charges that normally crop up. CHG staff were always courteous and friendly and dealt with all issue arising promptly. Central Housing Group managed our flat for ten years. We were too busy to look after it properly ourselves so it was a relief to find a company that could always find us tenants and who subsequently proved a hundred percent reliable. CHG staff were always courteous and friendly and dealt with all issues arising promptly. I always felt that when problems occurred, such a boiler breakdown, I could trust their choice of maintenance provider. The fees they charged were very reasonable considering the efficient way thay managed our flat. I would wholeheartedly recommend them to any landlord who wants a great service from friendly, helpful staff. I valued your professional and friendly timely service at all times…. 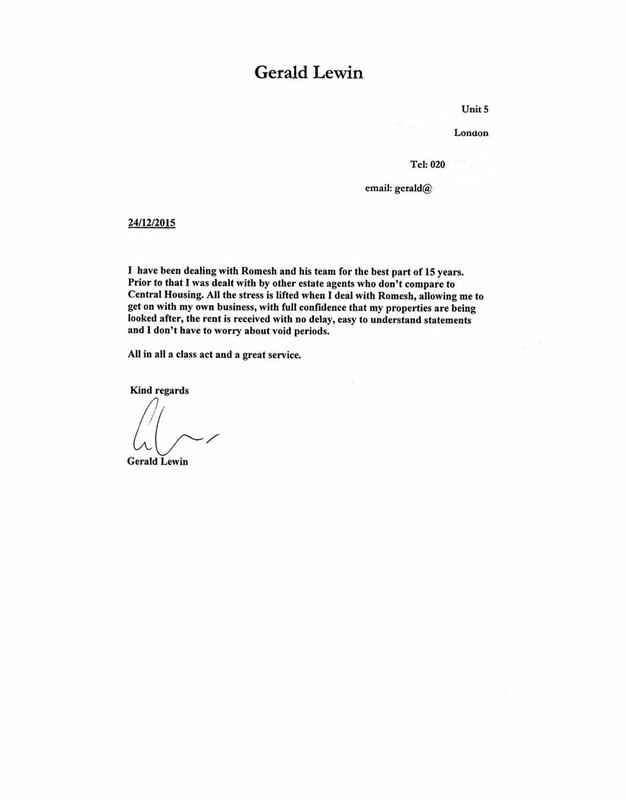 Following our conversation yesterday, I am writing to confirm that sadly I will not be renewing the rental contract with Central Housing Group at the end of May 2015 for personal reasons. I would like to take this opportunity to thank you and your team for the excellent service you have provided not only to myself but to the tenants in my flat. I valued your professional and friendly timely service at all times. Especially keeping me informed of any issues or changes and promptly resolving any problems related to the maintenance of the building and garden. I would not hesitate to use your services in the future as I have complete confidence in your customer care and the way you have created such a good friendly working relationship with me, always being so helpful. I would highly recommend Central Housing Group to anyone looking to rent their property and would have no problems in telling them about the great service you provide. This is just a thank you letter to you and all your staff for the continuing hard work when managing my property over the last two years. I’m very pleased with the excellent level of service your team provides and their efficiency in contacting me if there are any issues at the property. I have found your company to be very proactive and helpful in solving any problems that have occured in the past. Because of this reassurance I have a peace of mind knowing that you guys are doing the best. In the past I have found most guaranteed rent scheme companies offer a lot of services but fail to deliver. I would highly recommend Central Housing Group to anyone looking to rent their property and would have no problems in telling them about the great service you provide. Our rental payment are always received on time which leaves us free to concentrate on other aspects of our business. We have now been dealing with Central Housing since 2004 and have just entered into a new 12 month contract. Once again we were very pleased with your support in obtaining the best rent for our property. We have always found you and your staff to be most helpful and this was particularly apparent when our property needed refurbishing following the departure of our long term tenants. I would like to take this opportunity to thank you for the help and guidance received regarding managing my late Mother’s property for the past two years. It was the best decision I could have made to let Central Housing manage the property, it was hassle free, with no worries about collecting rent or meeting tenants, and with the rent guarantee scheme the money was. paid direct into the bank every month on time! I am currently looking for an investment property that I would have no hesitation in handing over to you to manage. provided without asking and I don’t have to touch the property at all, so it’s a complete hands off service. I am writing to provide my testimonial on your services. Central Group have managed a flat I own for several years. I have found their service to be excellent as a landlord. hands off service. I highly recommend their service if you are a landlord tired of dealing with day to day property management yourself. Repairs and maintenance are dealt with quickly and efficiently and rental payments are made without fail, on time, every month. Central Housing Group have been managing my property for nine years now, since placing it with them in 2007. Their management service is first class. Repairs and maintenance are dealt with quickly and efficiently and rental payments are made without fail, on time, every month. I have known the team at Central Housing Group for a long time now and they are knowledgeable, polite, responsive and friendly. Over the years I have recommended Central Housing Group’s services to my family who have also let their properties with Central Housing and so I would not hesitate to recommend their services to any landlord who is looking for a very reliable management service and long term, hassle-free guaranteed rent. With my sincere thanks to all the team at Central. Your management team are fantastic. Every problem or issue was dealt with rapidly and very professionally. Firstly I would like to thank you very much. Your management team are fantastic. I regularly hear of problems that landlords have with management teams but I feel lucky to have worked with you and your team. Every problem or issue was dealt with rapidly and very professionally. As you know Jonathan Ellis , who came recommended by yourself, sold my flat within a week of it being on the market. I really needed this to happen so I can dissolve any connection I had with my ex-wife so it came at a wonderful time. 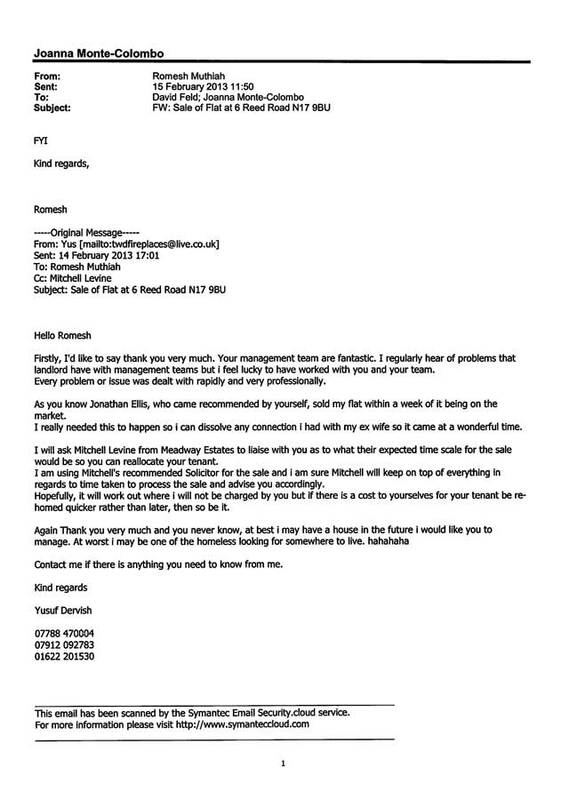 I will ask Mitchell Levine from Meadway Estates to liaise with you as to what their expected time scale for the sale would be so you can reallocate your tenant. I am using Mitchell’s recommended solicitor for the sale and I am sure Mitchell will keep on top of everything in regards to time taken to process the sale and advise you accordingly. Hopefully it will work out where I will not be charged by you but if there is a cost to yourselves for your tenant be re-homed quicker rather than later, then so be it. Again thank you very much and you never know, at best I may have a house in the future I would like you to manage. At worst I may be one of the homeless looking for somewhere to live. Contact me if there is anything you need to know from me. I want to thank you for the excellent management by you and your team…. I want to thank you for the excellent management by you and your team of Whitehead Close. The sale seems to be going ahead and I can’t believe it’s all happened so fast. I would also like to inform you of my change of address from 30-3-07. I hope to keep the same phone number. I have been letting my flat through Central Housing for 10 years now and the service has always been excellent. I just wanted to say thank you so much for your help and concern with the new windows at Wilbury Lodge. Thanks for looking after my place. just wanted to say thanks for everything. Thank you so much for all your help and support…. This is a small thank you for ur support…. This is a small thank you for ur support with Stanley Road in the void period.